It's like Xmas wrapping around here tonight. I began my Starlet Suit today, mostly just doing prep work; no fabric cutting yet. And of course as soon as I give any indication I'm heading for the sewing room, there comes Bella--to offer encouragement & make sure she's in the middle of things! So I pre-shrunk the lining & iron-on facing by soaking it in warm water 'til the water cooled, then letting it dry overnight. And I pre-shrunk the wool fabric by steaming the heck out of it with my iron. You may remember that I bought enough for 2 suits last week--so that was 8 yards of wool I ironed by hand today. I'm sure it builds character. One thing I've been wondering about since I signed up for the course is because it's online and we're not using a standard pattern, where does the pattern come from? Would they mail it to us? I eventually realized it would involve some type of printing & pasting, but have to say I was a bit shocked that it was 56 pages! It took my little printer about 15 minutes to print it all. Fortunately I just changed my cartridges & bring home lots of scrap paper from work, so there were no glitches with that portion of the project. One thing that Gretchen recommended in the instructions for the pattern, though, was to check the pattern print test square to be sure it is 4". Then you can adjust your printer a bit to ensure the pattern is printing correctly. But there were no notes about which page that square was on. I flipped thru some of the 56 pages looking for it, thinking, "I'll print that page first, if it doesn't come out 4" I'll fiddle with the PDF file a bit & try again." I never found the test square, though, so ended up printing the whole thing...and there was the test square--finally--on page 5 or so. And, of course, my test square was NOT 4"!! It was 3-7/8". So what do I do? Print it all again? NOPE! Not me. I'm making a muslin first and will hope for the best. I'm going for the size 10 pattern, but will cut it out as a 12 for the muslin & see what happens. I have never been able to leave a pattern or recipe alone; I always have to fiddle with it a bit. Change the neckline, shorten the sleeves, add turmeric along with the cloves, whatever. So, of course I can't just do exactly what Gretchen says: I really don't want to use her skirt pattern! 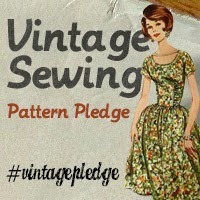 I've dug thru my stash of patterns (vintage & otherwise) and will come up with something cool. I'm going to do the jacket first, so I make sure I have enough for that, then I can use the leftovers for the skirt. I think that will be the grey w/ periwinkle pinstripes. And I am also thinking I might try to make a pair of pants for the other suit...that will be in the greenish wool. I have a few skirt-suits that I wear to work a lot, but it's the pant suits that are more comfortable & warmer when I'm at the reference desk. I am curious as to how the online sewing class will go; whether or not I'll be able to see well enough what Gertie's doing, and how it will be to not be asking questions in real-time...I have done an MA online and that was fine, because it was mostly reading & writing. We'll see what happens with this type of class. And if you're in the DC area & you want to take the Copy Your Clothes class at Bits of Thread in the Adams Morgan district of DC, can you please write to them & request it (info 'at' bitsofthred 'dot' com)...it's not on the calendar & I think it would be useful & fun to learn how to do this; especially with a few pairs of pants I have that fit really well. 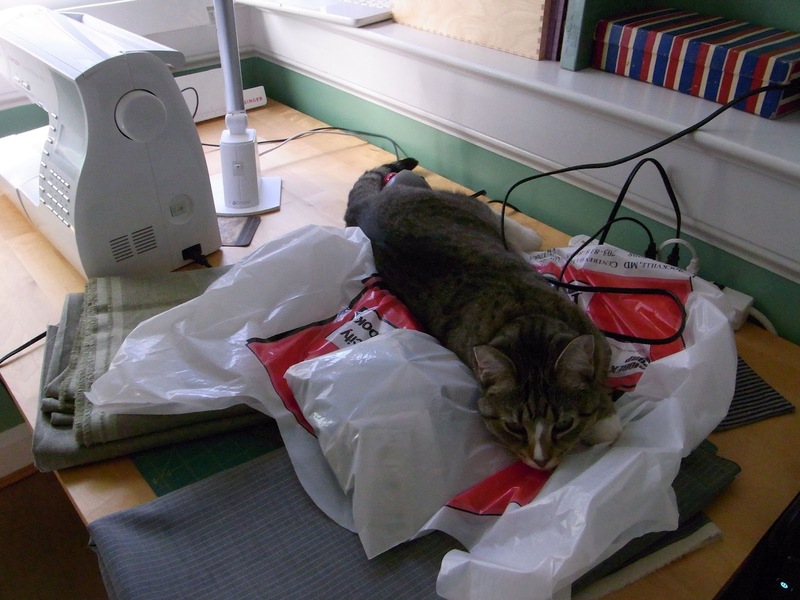 Well, the most important item on today's post is, of course, our cat, Bella, who likes the new layout in the sewing room. She immediately found an empty drawer to hide in and looked adorable. I then decided to use my new dress form & lots of extra pieces from my stash & leftover bits to try to make a toile. I made 4 eventually and cut & sewed & stitched & restitched & and put in darts & moved them & resized them and ripped out stitches & did it again & again & again. I won't go into the rest of the story (which involves canibalizing another pattern that does fit & then changing the neckline & sleeves). But at least you can see that it's finished. I wore it to work today & got lots of compliments! It goes especially well with all my turqouise jewelry. It's not perfect, but it's good enough. 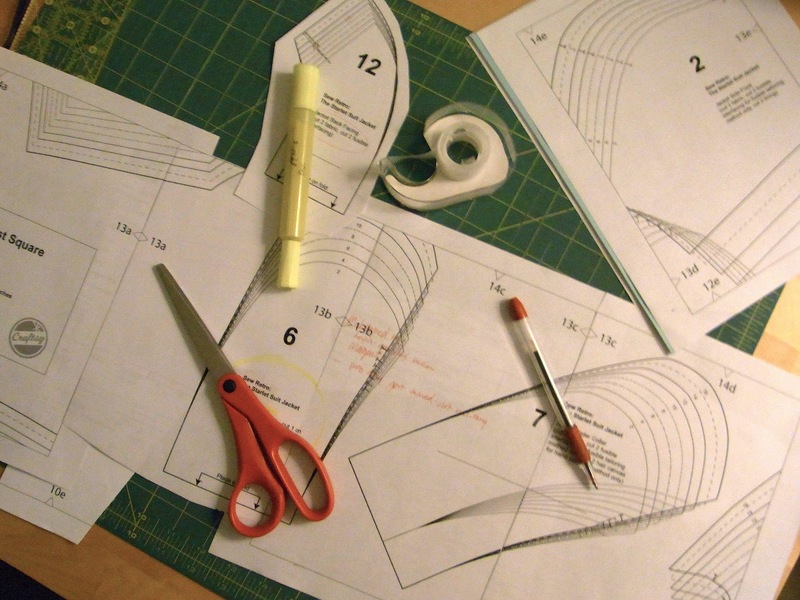 I'm not dumb enough to think that pattern making or alteration is easy, but I had no idea how hard it was...I just kept feeling like I'd get it--but I really never did. Another thing is that unlike the Slenderette/Simplicity 2847, this one rolls back on my shoulders. That is a problem I often have with tops & dresses I buy readymade, but I've never had it happen with a dress either I made, or Mohammed made. So that's a bit weird. Hopefully some of these questions will be answered as I take some classes at Bits of Thread & online with Gertie. New color in the sewing room! It's Southfield Green from Benjamin Moore...sort of a Williamsburg-y green. Not Williamsburg, NYC--Williamsburg, VA! And the 2 after shots. I think you can see how well the green looks against the white trim,and also how nice it is with the light wood furniture...all from Ikea, except my wall-mounted ironing board, which is also birch. I don't have that much I can do w/ the 2 tables, the cabinet & 2 small drawer/file cabinet units (one is for my notions, the other is for our files & the printer lives on top of it). But I am trying a bit of a different layout. I wanted to get the cabinet away from the door because it made the room hard to look into & rather uninviting. If you're wondering about the dress, I'm about to go put the hooks on it (got them at G Street yesterday when I bought enough wool for 2 Starlet Suits!) and I've already hemmed it. I'm wearing it tomorrow, even though it's going to be too warm (60F)...but darn it, I'm wearing it! Pictures will be posted! Music? Paint it Black by you-know-who! Okay, reading public. I know there are a few of you out there & I appreciate your time. Just to let you know I'm not lost in the mess that is DC politics--I wish my life was that glamorous. I'm actually extremely busy. I think I may have to go back & read Tilly's blog post about her Sewing Productivity Project Survey, because I cannot figure out how my online sewing friends have jobs, friends, roommates, clean houses & manage to exercise and play with pets, while making zillions of amazing, well-tailored, lovely outfits. I only work 9 days every 2 weeks, so that means I commute 1 day less than a lot of people (45 mins each way), and of course I get that extra 8 hours. So where does it go? If you're wondering what's occupying my mind at the moment, we're going to re-do our kitchen this summer. 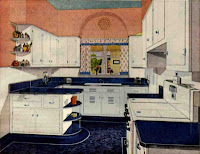 See this American Standard ad from 1946 to get an idea of what's inspiring us (our house was built in 1937). 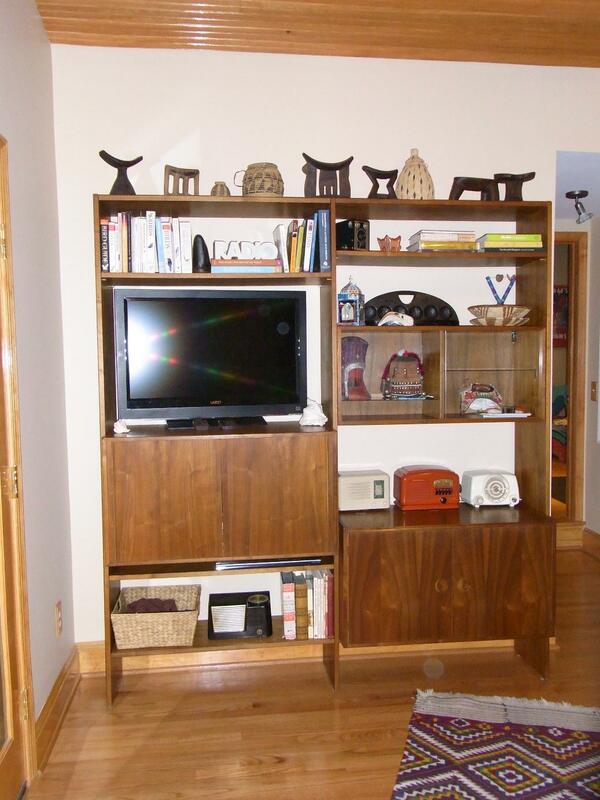 We have stainless appliances, and will have white cabinets & blue-ish counters. We haven't picked out the floor & backsplash, but hope to do that this weekend. But this is all pretty time-consuming--though it's REALLY fun! What's funny is that we are about the quickest decision makers around, and still, it's time-consuming. 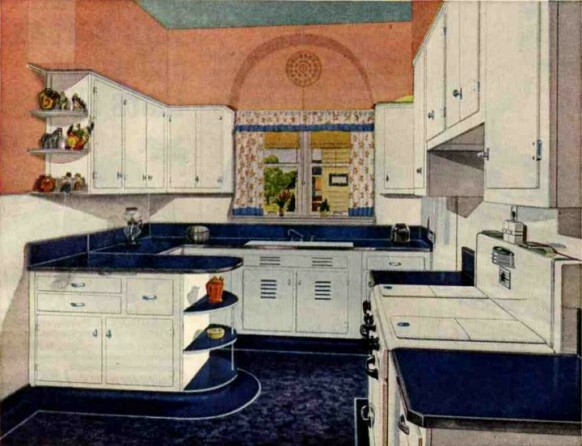 Some fun sites I've come across while thinking about our kitchen are Retro-Renovation, lots of great ideas, photos, old advertisements (like the one above) and even places to get antique items (there's a link to a tile factory that has a bunch of stock from the 1950s & 1960s). Another is DalTile, which has a mosaic designer tool--hours of entertainment! On the tabs across the top, click Be Inspired, then Tools, then Mosaic Designer. Second, you may remember my problems w/ trying to get my tiny extra room (10' x 6') turned into a sewing studio. I bought a cabinet, am using 2 old tables (one a gateleg), and got it arranged in what I thought was a good way...but after 4 months or so using it I realized it's a) not light enough and b) the arrangement is just rather weird. So, this weekend (it's a 4 day weekend), I plan to finish the dress. Yes the dress! That I started on in October?! Then I am going to take everything out of the sewing room & the Roommate & I will paint the walls and rearrange the place. After that, I'll have to find some more lighting and I'm thinking of putting up some additional shelves. But that will be after sew/remove/paint/move back in...I will draw before/after plans to show you once that is finished. However, if nothing else the dress has taught me that I want to improve my sewing skills. So first, I'm taking an in-person class at Bits of Thread in DC in late March. It will be the perfect skirt class...so I'll make a pattern & then a skirt over 2 3-hour classes. And I'm seriously thinking of signing up for Gretchen Hirsch's class (of Sew Gertie Sew fame) to make a Starlet Suit. It's online, and I think I'll learn lots of good techniques, and taking another class will motivate me, too. Those are my plans for spring 2012...the next time you see me, I promise I'll be wearing 7051, if it kills me. If it does, I can wear it to the crematorium! 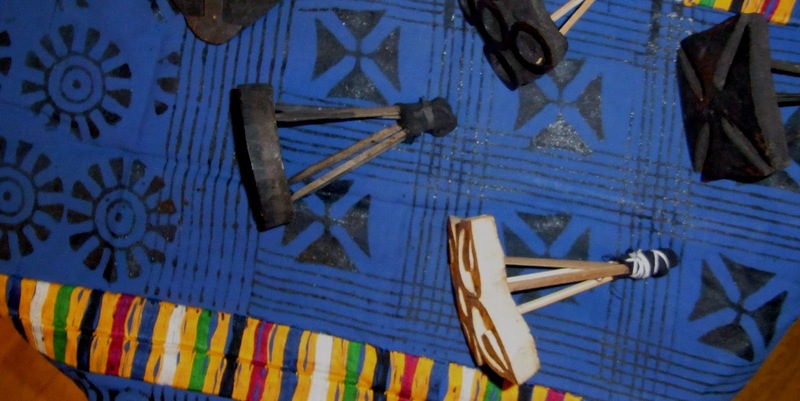 I've mentioned before how we collect not only textiles, but also tools used to make those textiles. 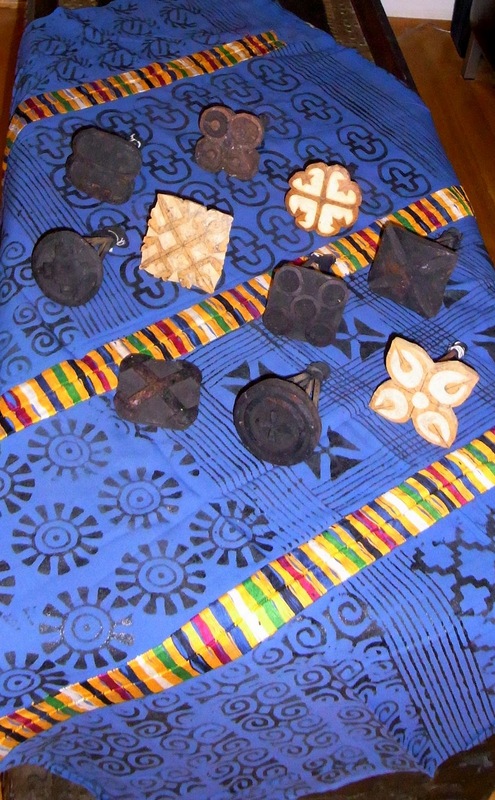 So here are some Adinkra stamps along with a piece of Adinkra, all of which we got in Ghana. (Our travel photos from that trip are here.) And here's a video of someone using the stamps. The stamps are carved from calabash gourds & you can see on the 2nd example that they are curved. You'll notice in the video that the printers have to "rock" the stamps a bit to get the complete design to stamp. A piece of fabric uses many different stamps, broken up by the colorful embroidery used to stitch 2 strips of fabric together (again, strip woven fabric used as part of the overall design), then they use a piece of wood that looks like a hair pick to make the parallel lines that also make the outline of the checkerboard. The stamps represent ideas and proverbs. Head on over to adinkra.org to see an explanation of what the different symbols mean. (Click on the symbols at the top of that page.) Photos of a stamp carver hard at work are here. In the second photo, I was trying to show you how the stamps are held. Each one has little holes in the back (3 or 4, depending on the size/shape of the stamp). Small sticks are inserted into these holes (they look like overgrown toothpicks). Then the 3-4 sticks are held together with a piece of cloth bound by string. It is not at all stable, everything slips apart quite easily. We try to never handle ours because they dismantle if you look sideways at them! We took them all apart to get them home, but have tried to avoid that since. We bought our stamps at a tourist shop in Tamale and they haven't been used.